I was thrilled to receive this special sketch from my Boss's little girl. She is only 12 but sure can draw like a pro. 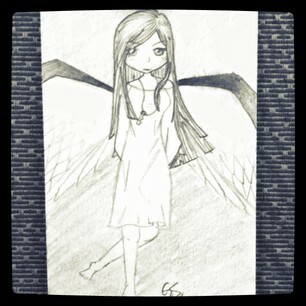 She drew a pretty Anime like angel for me and said I could keep it since it wasn't one of her best work... haha. Don't we just love kids! I have it hanging in my cube and will save this sketch for when she grows into a popular artist one day. Then I can tell the world that I own one of her very first artwork.